Our pencil-necked gamester in-laws at Kotaku gathered a rumor today, where an employee of the vast retail empire Target noticed that Sony's proprietary UMD movies had suddenly disappeared from his store. Could it be the doomed format's death rattles are beginning to bear their certain, inevitable fruit? I work at a local Target store, at the electronics department. I walked in today and noticed something missing, other than my desire to be working, it was the PSP UMD movies section. Thinking it was moved I searched then finally decided to ask around. To my suprise, my boss told me that Target wasn't going to be selling them anymore. Now I'm not sure if its in every store, but I decided to give the other targets a call in my city, and they also said they had pulled them. 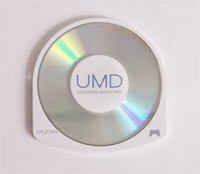 So, not sure what that means, but with so many people saying the UMD movies are pretty pointless, and sales being sluggish, I cant help but wonder if PSP movies are soon to go the way of the Betamax. We saw this coming months ago, as did nearly everyone else. Maybe one of these days Sony will finally realize that every proprietary consumer format it's introduced has tanked. Add one more to it with the UMD, where its absence from Target is probably just the beginning of its one-way trip to the ash heap of history.